Apparently it is 90 years today since the royal family changed their surname to Windsor. It was done in the middle of WW1 because the old name sounded too German. According to an on-the-street radio reporter survey this morning (in Newcastle) one person thought the Queen’s surname was Rex. 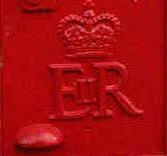 Her initials are on the post boxes aren’t they? This entry was posted on 17 Jul 2007 at 14:55	by Rick	and is filed under Miscellaneous. You can follow any responses to this entry through the RSS 2.0 feed. Both comments and pings are currently closed.